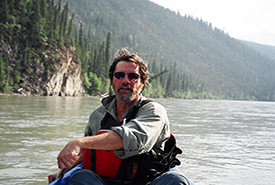 Reception: 6:30 p.m. | Presentation: 7 p.m.
Join the Nature Conservancy of Canada (NCC) and grizzly bear biologist Michael Proctor for a bear’s-eye view of life in the Kootenays. Dr. Proctor will share his insights into the habitats and migration patterns of this iconic species and show how their future will be shaped by the decisions and actions we take today. Michael Proctor is a renowned grizzly bear expert. 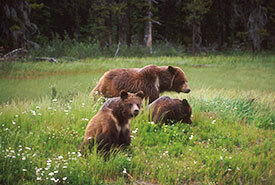 Dr. Proctor is a renowned grizzly bear expert and the lead Canadian researcher in the Trans-border Grizzly Bear Project. He works with the South Selkirk grizzly bear population, a small and threatened group of approximately 45 bears that roam the mountains around Nelson and Creston in BC’s West Kootenay. NCC's Darkwoods Conservation Area forms an important part of their home range, and Michael has been catching bears to outfit them with radio collars since 2006. Knowing where the bears go — and where they don’t go — is critical to guiding efforts to protect habitat for these magnificent and ecologically important creatures. Get a taste of Michael's storytelling chops as he shares his secrets for how to catch a grizzly. This year marks the 10th anniversary of the Darkwoods Conservation Area. NCC acquired Darkwoods in 2008 from a German duke who had held it as a Cold War refuge for 40 years. The duke had protected it from large-scale development for all those years, and many wild creatures, including grizzlies, thrived in this refuge. 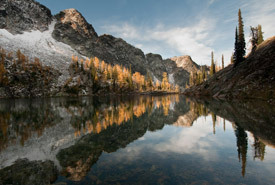 When it came time for the duke to find new caretakers for this land, NCC and our supporters stepped up to ensure the 136,000-acre (55,000-hectare) mountain property remained protected. Conservation biologists have been exploring this vast conservation area in an effort to learn the secrets and successes of the wild plants and animals that call Darkwoods home. As one of these researchers, Michael Proctor will share highlights from the ongoing research that helps us understand how valuable this particular wildlife corridor is for many species, including the iconic grizzly bear. For more information, contact bcoffice@natureconservancy.ca.